Hyundai Accent, also known as Hyundai Verna in some of the Asian markets, is a sub-compact car from Hyundai’s lineup. It is a globally successful car by Hyundai, sold across several markets on a couple continents. In certain markets, such as China, Mexico and Venezuela this car is sold under different brand names. Since 2002, it is the longest running family sub-compact sold in North America. 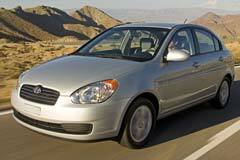 The first generation of the Hyundai Accent was launched in 1995, as replacement of Hyundai’s Excel. Accent was launched in the Australian market as X3 and was highly successful in gaining market share over there. The 2nd generation of Accent was introduced in 2000 with better design options and bigger dimensions. The third generation of Accent was released in 2006 with more a curvaceous design and larger interiors. The fourth generation was launched in 2010, which is the current generation. The latest generation has an updated appearance and a more powerful engine. Also, over the years, the Hyundai Accent has also been sold as a sedan, hatchback and even a coupe. The Accent has seen various engine options with different power outputs. The Accent was initially available in a gas version only, but was later launched in Diesel variants as well.